They say the kitchen is the heart of the home. I’d argue that it’s the bar. 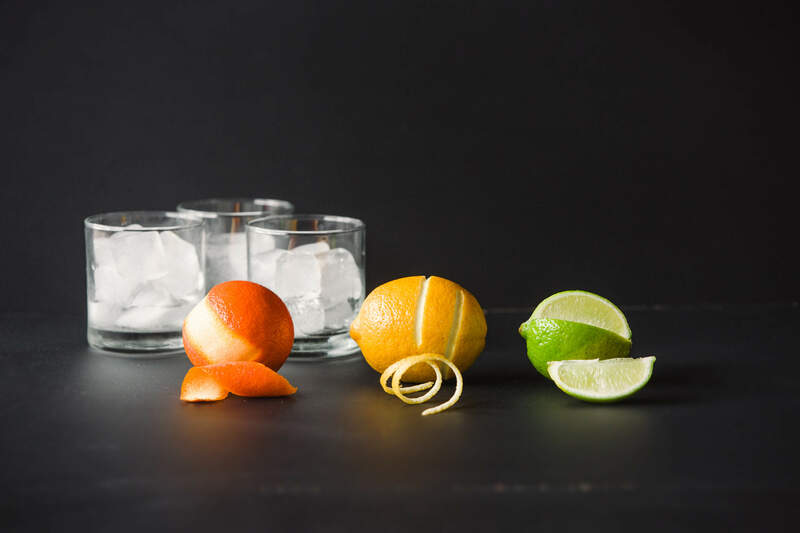 Whether you’ve been crafting cocktails for years, or you’re just beginning to dabble in the art of drink mixing, every at-home bar requires a basic set-up. Determining what you need in the bar can be a daunting task, particularly for those who want the flexibility to concoct any cocktail at the drop of a hat. Tools for mixing and cutting garnishes, bitters and syrups, and glassware to serve all must be considered when stocking your bar. Fortunately, you don’t need the fixings of a full-service bar, or obscure tools to make most drinks. To assist you in your mixology endeavors, I’ve included only the essential tools and equipment to get started. All to be used within the comfort of your own home. Sure, you could free pour, but at the risk of the cocktail’s quality. Jiggers, on the other hand, allow you to precisely measure the ingredients in your cocktails. They are sold either as a set in varying sizes or one single jigger that can measure multiple volumes. Either is fine, but I find using a single jigger keeps things simple. If you are a true stickler, it is also useful to keep measuring spoons handy for recipes that call for smaller units of measure. 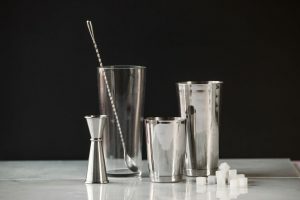 Shakers are an essential piece of making cocktails that contain juice and/or herbs – not as essential for making martinis, Mr. Bond. They are available in many styles, but the two most common are the Boston shaker and the cocktail shaker. The Boston shaker is two pieces, a 16 oz mixing glass and a larger metal container that covers the mixing glass. The cocktail shaker is a single vessel and lid with a built in strainer. 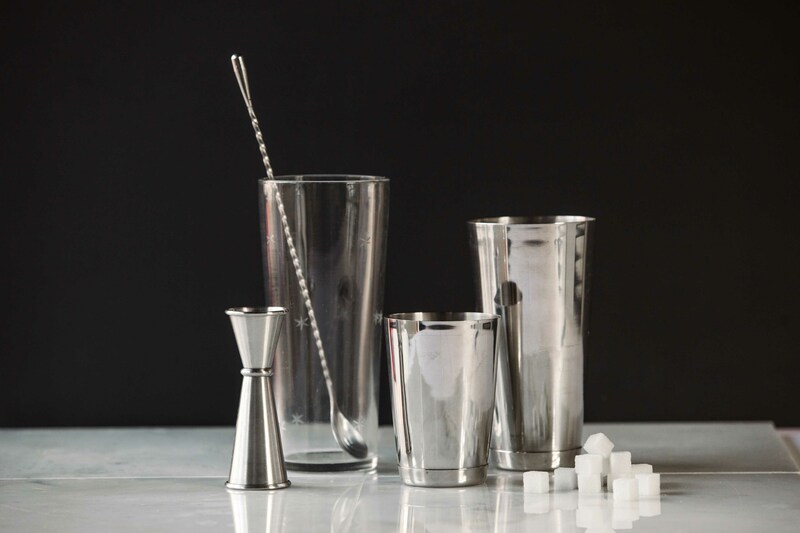 The Boston shaker is standard for cocktail bartenders and the larger capacity allows you to make two drinks at once. On the other hand, the cocktail shaker is more compact and simpler to use, making it a good choice for beginners. Either will work just fine for use at home. When a fruity drink just won’t do and you want a cocktail that contains nothing but booze, you’ll need to be able to stir it. Stirring the drink will keep the clear ingredients clear. Additionally, and equally important for potent cocktails, stirring with ice will dilute it less than shaking will. To properly stir, you need a barspoon, a long spoon with a small weight on the end. When stirring your cocktail, put all your ingredients in the mixing glass of your shaker (a pint glass works well too) and use the spoon to mix it all together. The weighted end of the spoon can also be used for muddling herbs or other ingredients, although an actual muddler serves this purpose more efficiently. The final piece of equipment is a strainer. This allows you to pour the cocktail from the shaker into the glass while holding back dirty ice and other byproducts of drink mixing that shouldn’t be served. 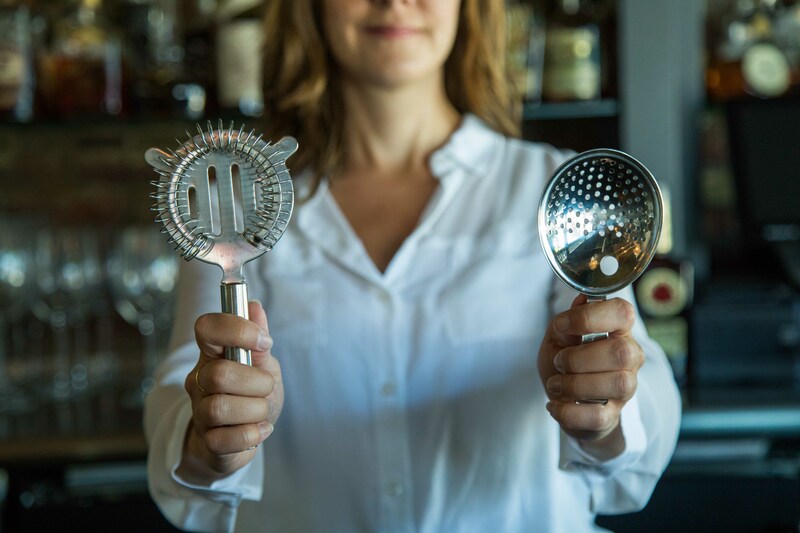 There are two kinds of strainers to keep in stock: a Hawthorne strainer and a julep strainer. The Hawthrone strainer has a wire coil and is used with your Boston shaker. A julep strainer has several small holes and is used for all-spirit cocktails that will have little debris to hold back. You may also consider a sieve to filter out finer bits of herbs or fruit that the strainers won’t catch. The type of glass you serve the cocktail in is important, but no need for anything too highfalutin. Having just a few types of glasses will serve you well for the vast majority of cocktails. The classic martini glass, also called a cocktail glass, is a must. As is the smaller old-fashioned glass for drinks served on ice. A third glass, the Collins glass, is a tall, thin glass used for, you guessed it, a Tom Collins. It’s great for drinks that need a little more volume or for your gin and tonic. A fourth glass, the coupe, could also be useful, but in most cases a martini glass can substitute for the coupe. Six to eight glasses of each is likely plenty for at-home bars. Making cocktails requires lots of ice, so have plenty handy. Keep in mind you will need ice for both mixing and serving drinks. In other words, when serving a cocktail over ice do not use the “dirty” ice from the shaker. And if a choice is available to you, opt for bigger ice cubes. They will dilute your drink more slowly, so having bigger, whole cubes is preferable. Ice trays and molds for larger cubes are easily available online, just remember to freeze extra in the days leading up to a get-together. For presentation’s sake, you will also want an ice scoop and bucket. Countless cocktails require simple syrup, so it’s good to have around. You can purchase it at the grocery store, or make it on your own. 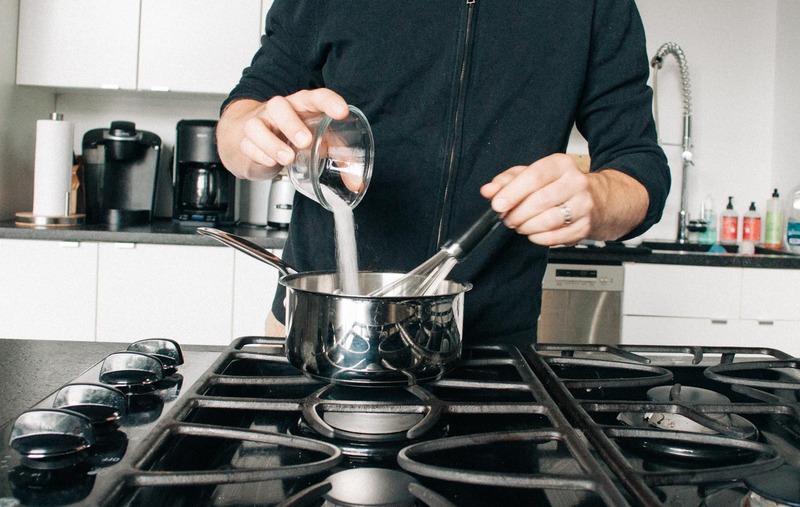 Just bring equal parts sugar and water to a boil and chill. If run-of-the-mill simple syrup bores you, try an altered recipe for added flavor with anything from chile to lavender. Unless you only want to make the sweetest of cocktails, having a bottle of bitters is imperative. Angostura bitters is used in hundreds of cocktails. Peychauds bitters is also great to have on hand for their light, fruity, and sweet flavors. If you need a more in-depth review of bitters you might be interested in our post devoted to bitters. Fruit is a key ingredient in many cocktails for both their juice (do right by your guests and always use freshly squeezed juice) and as garnish. A citrus reamer will be needed to juicing, a vegetable peeler for making twists, and a sharp paring knife for making garnishes. The most commonly used fruits are lemons, limes, oranges, grapefruits, olives, and cherries. Since you must buy fruit fresh, the selection will depend on the drinks you intend to make. Many cocktails are made without soda, but sodas are still nonetheless important for a basic bar set-up. Club soda, and tonic are the most commonly used but Coke, Diet Coke, and Sprite are also good to have available. Sipsticks, stirs, straws, and cocktail napkins are often overlooked, but are an important part of serving drinks so keep some around. Once you have these items, all you need is the booze! You’re now able to make the vast majority of cocktails from Martinis to Daiquiris. If you want to go past the basics and into more specialized equipment and techniques head on over to our Bar Basics.